These cards came in a big ol' bubble envelope. Why? Because I bought 'em, that's why! See, StaleGum listed a bunch of things on eBay for sale. I helped kick off the sale by bidding on everything that was available for 99 cents. Well, as my luck runs on eBay, I won several of Chris' auctions whether I meant to or not. It turns out, winning them was a cool thing. 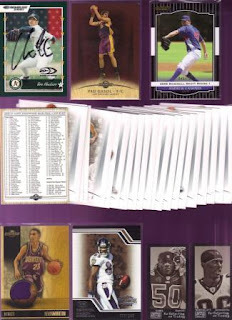 The other cards in the photo above include: Topps 2008-09 Hardwood Pau Gasol (35/75), Razor Black Border Andrew Cashner (Cubs, 045/200), a stack of 2008-09 Hardwood cards, Topps 08-09 Hardwood Relic Kevin Martin (75/75), 2008 Topps Triple Threads Derrick Mason (099/249), Mayo Cut Plug Sims and Northcutt. Those have "Y" on the back. I have no idea why. I don't collect football or basketball. That means these will find their way into good homes eventually! 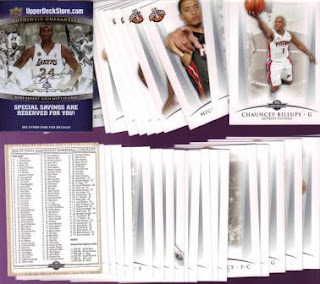 Next up, we have a stack of 2008 Razor draft picks. 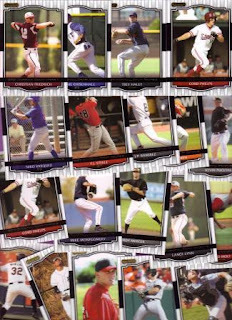 The top row features Cleveland's picks (Christian Friedrich, Lonnie Chisenhall, Trey Haley, Cord Phelps. The rest are just randomly selected guys from the stack. I like the design of these, though they remind me of an Upper Deck, I think. I am not a big non-sport collector, but getting a mini Mayo Cut Plug of the Andrea Gail is VERY cool! I loved "The Perfect Storm," and when I showed the card to my wife, she instantly recognized the name of the boat. The other boat is the RMS Carpathia. Thanks to Chris for the auctions and for the ultra rare autograph! !